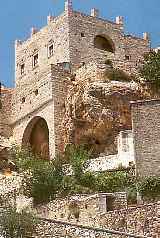 The Architecture of Cyclades, Greece-Hotels, Accomodation in Greece, Greek Hotels, Greek Lodgings. The basic characteristic elements of the insular architecture of Cyclades are expressed with the best possible way for the simple observer - visitor in Andros, Naxos, Sifnos, Santorini, Syros, Mykonos and Tinos, defining architecturally total complex of Cyclades. 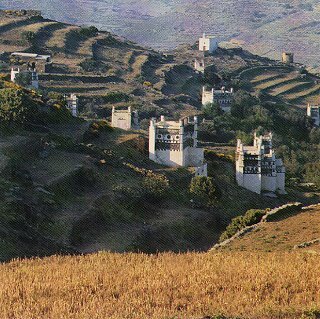 ANDROS: The settling was born as an extension of the Castle and became art of it. Its creation is attributed in the early Venicean years just all the other fortified settlings of the Aegean. The strongly built houses follow the line of the steep rocks. Their back is turned toward the sea and they have a "masgalia" at their disposal for their protection. a. The towers. Built far away from the sea, in selected areas of the plains. They had a basement (katoi) for the servants and the supplies, a story with a reception area and a second story with bedrooms. Today the meaning of the tower has been extended and the noblemen's houses (archontika) are called so. b. The long house. Built with two parallel areas where one is placed behind the other one. c. The stone rustic huts and the threshing buildings, which in the spite of the humble buildings, material and their use, they possess interesting architectural elements. d. The fountains. Found throughout the island without differences in form among them. e. The dovecotes. Possessing a simple arrangement, with a basement (katoi) for the peasants' use and an upper level (anoi) for the pigeons' nests. We have to mention that the dovecotes of Andros do not possess the decorative richness of the ones of Tinos. f. Xerolithies. Endless lace from slates, it is worthwhile for one to pay attention to the plates (coat of arms) surrounded by a wall over the doors and windows. NAXOS: The Castle, which was created under specific historical conditions, is one of the few saved as a whole in all of Greece. The setting nucleus, which developed based on the Castle, constitutes the primitive form of the city structure. Outside the Castle were created six more neighbourhoods, whose house development, follow the old pathways around the hill. We can divide the houses of Naxos in tree categories. a. The common houses, found in Chora and in villages, represent the most widely found-type of housing, which began as an one-room unit. As this type was developing, it created the "anokatogo" which is the most widely found in the Chora of Naxos, with basement (katoi) for the auxiliary areas of the house (kitchen, stove, etc.) and an upper level with the living room and the bedrooms. b. The noble men's houses (archontika) of Chora, are composed of a central living room with perimetrical bedrooms approximately equal in size among them. Many of these are two story buildings, with bedrooms placed in the upper level. c. Towers. There are approximately thirty in Naxos, mostly build around 1600, confessing the Venicean rule on the island, constructed by local craftsmen, they combine in one and unified building western and Cyclades architecture. They had a basement (katoi) for auxiliary needs and a great living room in the upper level, with a flat roof (doom). An important element, in the morphology of the appearance of a house in Naxos is the chimneys (anefani) with a great variety in form and composition. MYKONOS: An island with a completely different edaphological form from the one found in most islands of the Cyclades. The characteristic of Chora is the labyrinthine roads, where one will never find a square and where the road is a commonly used area and can be thought of as an extension of the houses. The construction of the Myconian house has the same characteristics with the remaining Cyclades. SANTORINI: In spite of the particularity of the site, the local architecture has many common characteristics with the others islands of the Cyclades. The type of the ground permits to build underground's building and upon these to exist cultivable field. Buildings practically suspended on the paving stone so closely tied each other as to not distinguish the property limits. We may distinguish buildings caved completely inside the base of the Aspa buildings above the ground and semi- builded, where the first part, the entrance, is builded and the remain is digged. The farm has a big court and additional rooms, towards its central nucleus and in anyway the necessary underground tank for the collection of the rainwater. SIFNOS: The defensive settling, that is to say the settling of Castle, preserves its middle age fortified character with raw of houses which form a wall. The shopping centre in the port, with shops and store houses. The extreme houses, which formed the walls of the castle, had some small openings for safety reasons. The balconies and the windows that we see today obviously added recently. We would characterize all the other settlings of the island as traditional. SYROS: While the structure of the gourd and the size of the island do not differ from the other Cyclades islands, however, its position as intermediate stop to the port of Piraeus made of this island, during the second half of the 1800's and the first decades of the 1.900's a big commercial and industrial centre. This historic turn led to the creation of various architectures which we see approaching the island. The traditional Cycladic architecture in Ano Syros and its settings villages. These houses can be divided in the following categories. a. One-story with living room, and additional rooms. b. Two-story with store in the ground floor and homes in the upon floors. Characteristic of these houses is the coating in the lower part of the facade which different them from the other houses. Another interesting point is the "sameri" a 30-40 cm area with different wall plaster and deep colour. The settling of Α. Syros does not differ of town planning from the other Cyclades settlings and we can distinguish the Cyclades settlings town planning. Neoclassical buildings built by traders-ship owners and by those, in general, who arrived in the island during the past century and made investments, creating the neo-classic Ermoupoli. Industrial buildings, with all the characteristics of the architects of such buildings. Finally, storehouses, Neorio, the architecture of Lazareta are very interesting. As far as the architectural charter of the island is concerned, Syros could be considered as a living history of architecture. TINOS: The inclination for the ground was considered a main factor for the form of Tinos houses, which are developed as one, two or three story buildings. Most of them with a short facade, due to the absence of space. One building is the main elements of Tinos houses. They are composed from a livings room and one or more smaller bedrooms. Most of the houses are two buildings. With the additional room in the basemen (katoi) ground floor-whereas the living room and the kitchen in the upper floor (anoi). You must note that in the basement you can find the winepress for the wine and the hideout for children and women. In Tinos house we should note the large use of Aegean volutes, which had mainly a static use. The wells are composed of a rectangle cistern, which is filled with water, which comes from higher and is protected by some sort of gallery built to ensure rest and coolness. Dovecote. Α Bird habitat, which in Tinos became art works. In every spot of the fields, the artist built a rectangular building, which led to plastic compositions from thin, slates (the openings from which the birds entered). We find them in endless combinations, which are characteristic of the artists of Tinos. Holidays in Greece, Tourism & Travel Guide of Greece.